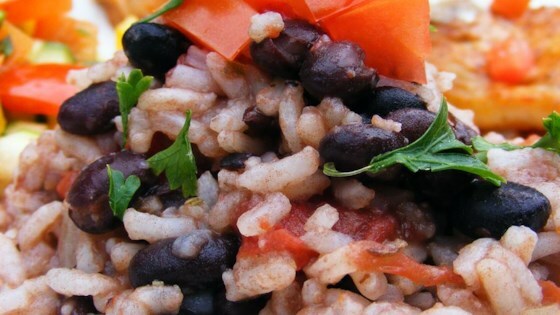 "Some say beans and rice is the most nutritious and well balanced meal in the world! Try adding your favorite chutney or salsa to this dish when you serve it!" In large saucepan, heat oil over medium-high. Add onion, cook and stir until tender. Add beans, tomatoes, oregano and garlic powder. Bring to a boil; stir in rice. Cover; reduce heat and simmer 5 minutes. Remove from heat; let stand 5 minutes before serving. I thought this was fairly bland and gummy tasting. It was very easy to make, but it needs a lot more spice. An easy and delicious recipe. My whole family loved it. I served the beans seperate from the rice so everyone could choose how much they wanted. Next time, I think I will make double. Extremely straightforward, simple, and tasty; plus, it doesn't require any fancy ingredients. Also reheats well - I mixed it with chunky salsa. Will definitely have again!